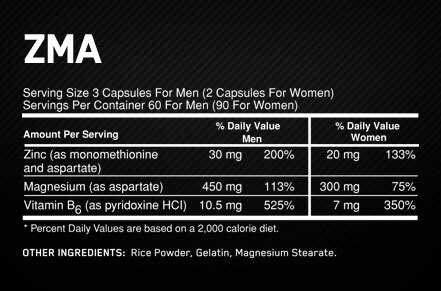 Optimum Nutrition ZMA contains the patented blend of Zinc, Magnesium, and Vitamin B6 that's designed naturally increase testosterone production levels and help you build more muscle and strength. University laboratory tests suggest that this formula enhances healthy testosterone production, leading to an average of 2.5 times greater muscle strength gains in athletes. Two recent clinical trials have shown that a synergistic combination of Zinc Monomethionine Aspartate, Magnesium Aspartate, and Vitamin B6 can significantly increase anabolic hormone levels and muscle strength in well-trained athletes. The novel Zinc Monomethionine Aspartate formula may also help to increase endurance, healing, growth and restful sleep.